The new sign on Coastal Highway went up late this summer. 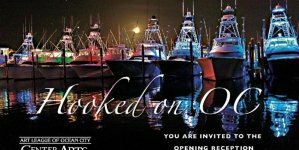 Major changes are now underway in a well-known building on Ocean City’s 55th Street, bayside. Some of these changes are in progress, some are slated for the near future and others are already depicting signs of what’s to come in the spot where OC Brewing Company once was — literally. 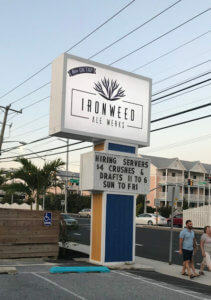 The street sign in front of OC Brewing’s old headquarters has been replaced and now boldly reads “Ironweed Ale Werks.” It features a stylized image of the native Maryland plant that’s also usually seen, in its natural form, on the side of the road. Also a part owner and operator of Independent Brewing Company in Bel Air, MD, Rhudy was brought in to Ironweed by his now-partner Bob Frankis, an operator of five Greene Turtles in Maryland and in Delaware. With their combined knowledge of food operation and the craft brewing process, Rhudy and Frankis are working to add quality products and an optimal brewery experience to Delmarva’s growing craft beer community. Most breweries lack space, Rhudy said, but in their building on 55th Street, there’s almost too much square footage, and they’re excited for all the possibilities that the new business allows. Inside the taproom, small changes have already been made to the function and decor of the space. 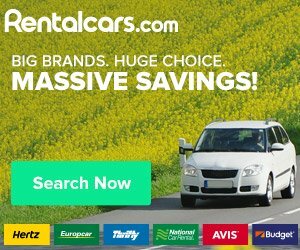 They’ll make more changes during the off-season, and any major changes they decide to make will happen further down the road. Right now, they’re busy focusing on what’s most important: The food and the beer. 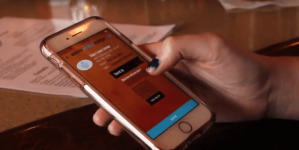 The food menu will see the most changes as they transition to all local and homemade items. “The food menu has been reduced to doing less, but doing it much better,” Rhudy said. Already, 10 Ironweed brews are on tap, and a new one is added each week. The tent didn’t exactly keep the rain out, but the Ironweed team was all smiles and samples at their station in front of the giant puddles. 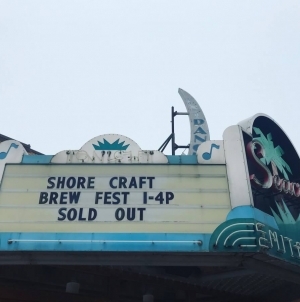 On Sept. 8, the beer made its debut at Shore Craft Beer’s Brews on the Beach festival, where hundreds of people turned out to drink beer under the Hooper’s Crab House tent in spite of torrential downpour that hit town mid-festival. 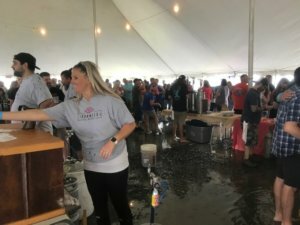 Under the tent, Ironweed’s table was in the center of all the action and received a steady flow of festival-goers who kept returning to try all four of the beers they were pouring. Those beers, which can be found today in their taproom, included Galactic Jack, a citra and galaxy hop brew balanced with sweetness from golden promise grains; Sharksbreath, made with huell melon hops added during dry hop and whirlpool but no bittering additions, giving the session beer all flavor without the “bite”; Harlequin IPA, brewed with citra and simcoe hops and honey and vienna malt for a dark, sweet balance; and Sour Diesel, a raspberry sour with a dry wine-like complexity for a nice tart finish. 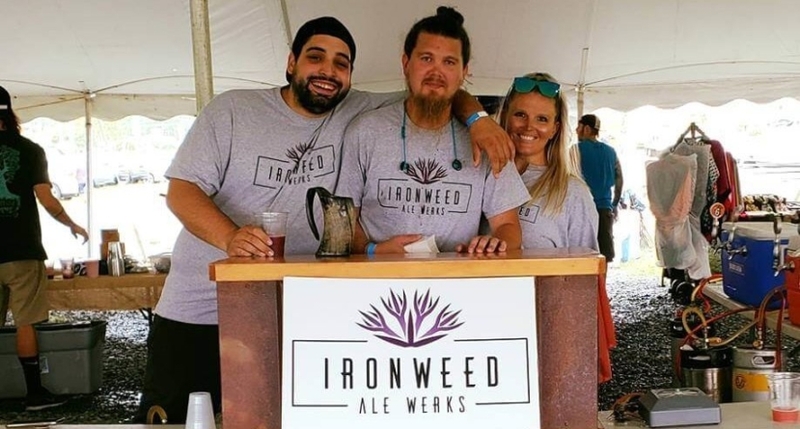 In addition to their availability on the festival circuit — Ironweed will also be in attendance at Shore Craft Beer’s OCtoberfest on Oct. 27 — the brewery is currently distributing in Worcester, Harford and Cecil counties. 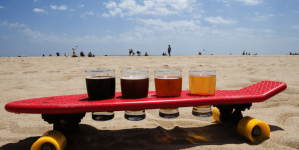 “The Eastern Shore has great breweries producing amazing products and we wanted to add to the Shore Craft Beer trail,” Rhudy said. >>Read more about Ironweed and the other new breweries on Maryland’s Eastern Shore.